Win a $5,000 Shopping Spree at any one of our participating retailers! And go into the running to be one of 8 to win a $500.00 pre-paid visa gift card. Simply purchase using Certegy Ezi-Pay before 11th March at any one of our participating retailers... it’s THAT easy! You’ll have the chance to win a $5,000 Shopping Spree! 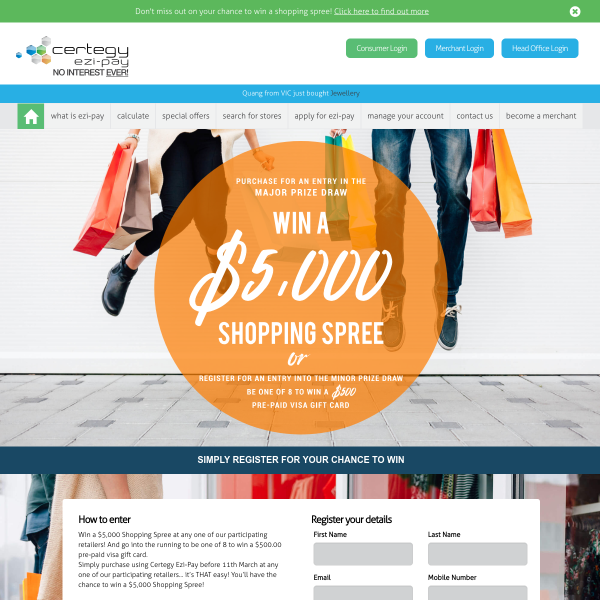 Certegy Ezi-Pay is giving 8 lucky entrants the chance to win a $500 Pre-Paid Visa Gift Card. All you need to do is register your details here and your entry will be submitted.